Social Bots, a Health Risk? Ladislao José Biró (1899-1985) was born in Hungary (László József Bíró) and ended his life in Argentina, where he fled as the Nazis swept through Europe. Journalist, inventor, businessman…, The inventor of the ballpoint pen (or birome in Argentina) was a man with a thirst for knowledge and many varied interests, from chemistry and painting to the social organization of ants, which he used to observe for hours, according to his daughter Mariana Biró, who now chairs a foundation in honor of her father. He arrived in Argentina with his brother Jorge (George) and his partner Juan Mayne, and shortly afterwards they were joined by his wife Elsa and his daughter. Argentina welcomed him with open arms and today remembers him as an institution: the day commemorating him is his birthday (September 27) and, every year, major national awards are granted in his name. This used to be the response to Ladislao when he explained his invention, according to Mariana Biró. During the period between the wars, and with the process of printing booming, typewriters at their peak and fountain pens affordable for many people, it appeared that the Hungarian-Argentinean inventor was “gilding the lily”: there were other priorities. But Biró was accustomed to dealing with words, as they were his raw material when he worked as a journalist: he knew what it meant to have to deal with ink smudges when inspiration makes you forget details such as the drying rate or time. The ballpoint pen is not yet one century old, while its “cousins”, the quill pen and its derivatives, have been with us for more than a millennium; and another “family member”, the printing press, for more than 500 years. The ballpoint pen is at first sight a simple invention, almost obvious to the eyes of homo digitalis. But it is a tool that took time to evolve from its ancestor (the quill pen) and begin to coexist within a very short time with a legion of successors (keyboards, touchscreens…). That is precisely what makes Ladislao such a brilliant inventor: he saw beyond what many people took for granted. He never gave up on his desire to improve a process that others assumed had already developed all its potential. How was it possible for humans to develop the telephone before the ballpoint pen? Or the typewriter? The ballpoint pen was created after the first keyboards (those of typewriters), but perhaps the ballpoint pen will always be used, while who knows when and by what keyboards will be replaced. That is how Ladislao described his invention, which in fact worked by using a system that has not evolved since then. Biró, with the help of his brother Jorge (a chemist by training) developed a mechanism to prevent the ink from building up and producing smears on paper: a “little ball” at the point of a tube which contained the ink. Where did he get the idea from? There are various versions of the story, depending on the sources. Perhaps Biró’s eureka moment contained something from each. According to his foundation, Biró was inspired by the mechanisms of newspaper presses: his invention was a smaller version of the roller that pressed the ink onto the paper, so it evolved to a spherical form. Other sources state that his idea came from something much more everyday: children playing marbles in the street. He saw how one of the glass balls went rolling through a puddle, leaving a perfect and even trail of water behind it. The business development of Biró’s invention began in a garage with 40 workers, like a startup in today’s Silicon Valley. 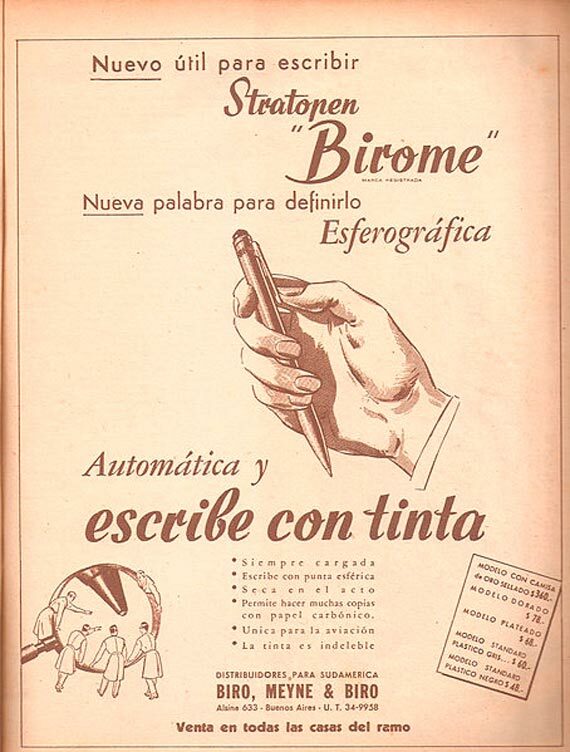 The ballpoint pen was born under the commercial name Birome (an acronym formed by the initial syllables of Biro and Meyne, the main partners). The benefits of the new invention were sold by highlighting characteristics such as instant drying, indelible ink or simply that it did not need to be filled, unlike the fountain pens of the time. Being a good technological entrepreneur, Ladislao also sold his startup to a larger company, the US multinational Evershap Faber. Ladislao was a pragmatic man with many interests, so he invented many different devices beyond the world of “journalistic” inventions. They included a pioneering washing machine, which used the energy produced by the home stove and won popularity in the 1930s; or an automatic gear change system (1932) whose patent he then sold to General Motors in Berlin. The company bought it not to manufacture, but to prevent the competition from doing so. The figure of Ladislao has not fallen into oblivion, as in his adopted country the Argentineans celebrate Inventor’s Day on September 29 in honor of his birthday. The ballpoint pen is thus an invention created by a master of words. A young inventor but so far without a rival, as there is no mechanism that advances on or modifies its operation. 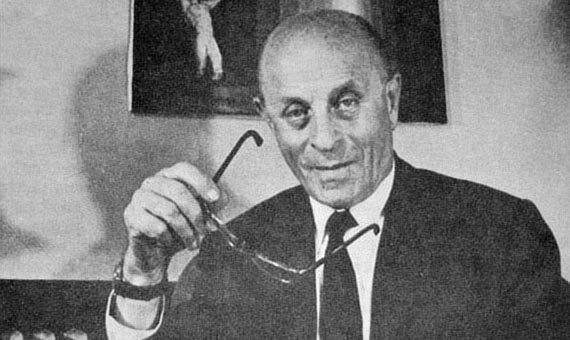 Mariana Biró says that her father was always a tireless thinker, who continued to invent and create after or despite his commercial success with the birome, and whose mantra was always what he defined as the nature of all inventors: “to see failures as challenges and maintain your imagination as your own incentive”.